Hello, there seems to be a problem, you have either not got java enabled, or you do not have the latest Flash player installed. Please click here to install the latest player, once complete, close that window and refresh this page. Water skiing is a surface water sport and recreational activity. Skiers wearing skis (similar to snow skis) are pulled across the water by a rope with a handle fitted at one end and attached to a powerboat at the other. Water skiing is an activity popular in many countries around the world where appropriate conditions exist - an expanse of water unaffected by to much wave motion. an expanse of water unaffected by to much wave motion. Sheltered Bays, large Rivers, lakes, and reservoirs skiing. There is no minimum age for this activity, youngsters learning the basics from as young as seven or eight years old. Rarely do youngsters compete in competitions under the age of twelve years. Beginners usually ski with two skis, a ski on each foot, at around 25-35kph. Dropping to one ski once confidence is gained, traveling at 45-55kph. It is actually easier to travel at the faster speeds because of the greater lift and stability. Within the confines of being pulled along by the boat, skiers can control their direction by balancing their weight on different sides of their ski. This is used to zip back and forth behind the boat. 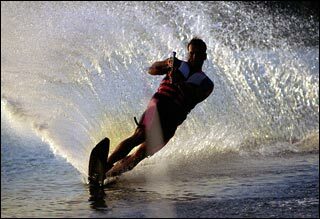 Leisure water skiers once competent at basic water skiing, often progress into the competitive water skiing disciplines of; jumping 559, Slalom 560, Ski racing and Trick 561. Several new sports have been invented that involve being towed behind a boat. They include Wakeboarding 630, Kneeboarding 798, Wakeskating 799, Scurf Boarding 520, Bare Foot Skiing 801 and Hydrofoiling 800. The table below shows the maximum levels of demand that this activity requires. NOTE: These are not entry levels or levels of requirement and has nothing to do with ability. Please be advised that this record has not necessarily been reviewed by people with the expertise required to provide you with complete, accurate or reliable information. The information and images for this activity are supplied by the general public, Please contact us if there is a breach of copyright or you wish to improve the data. HIPS FINDER LTD is registered in England, number 5601936.